We all look forward to a dessert, and the fewer we have, the more we appreciate the ones that really taste delicious. This is one of them. Baked apples sing a sweet song to all of us, whether we are Paleo or not, and you cannot tell that there is absolutely no gluten in this delish dish. Of course, the maple syrup helps in tricking your mind, and if you add a scoop of Paleo vanilla ice cream, then your taste buds will be in a baked blissful Paleo heaven – we need this sensation every once in a while. Almond and coconut flours make up the crumble portion. The almond flour really gives this maple apple crisp the amazing texture and flavor, so don’t even attempt to make it without! Make sure to buy a quality almond flour and refrigerate it if possible, storing it in a glass jar for up to 6 months. If you are buying in bulk, then you can freeze the excess, but if you have the time, then grinding your own is the freshest (and cheapest) way to go – all it takes is a food processor or blender, just remember to blanch them first. 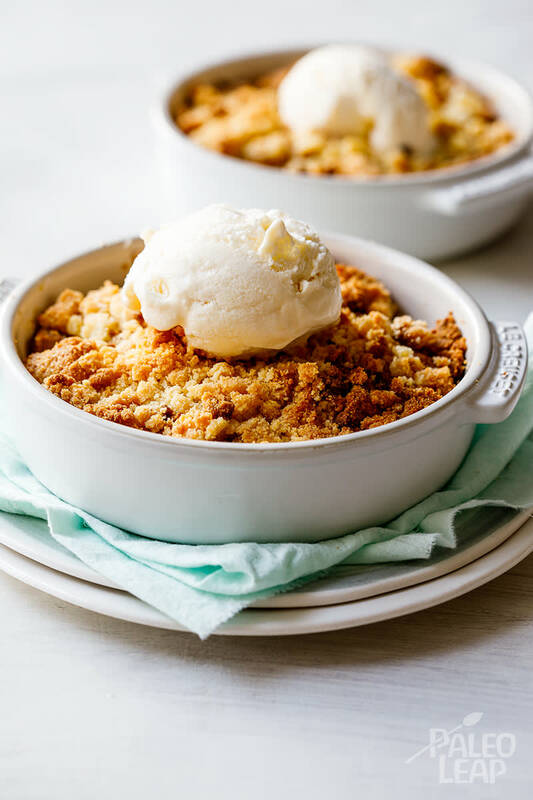 When you are in need of an indulge-ment day, ready for a little celebration or just a pick-me-up sort of sweet meeting with a ramekin, then bake up this maple apple crisp and share a spoonful of love. Combine all the ingredients for the crumble topping and rub the butter into the flour with your fingers until the mixture resembles a rough crumble. Combine all the filling ingredients in a separate bowl and mix well. Transfer the filling to oven-proof ramekins and top with a generous amount of crumble mixture. Cover with foil and place in the oven. Allow to bake for 20 minutes or until the apples are cooked. Remove the foil and allow the crumble to bake until golden brown (approximately 10 minutes longer). Remove from the oven and serve with a scoop of Paleo vanilla ice cream, optional – but highly recommended.